Flooring The Consumer: Women Call Retail Shots; Is Your Store Woman Friendly? 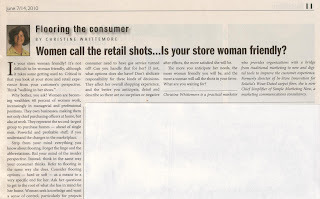 Women Call Retail Shots; Is Your Store Woman Friendly? 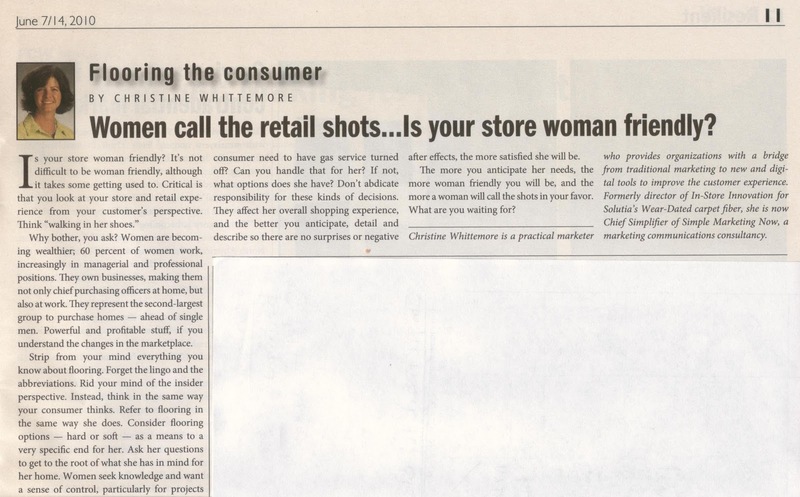 This article titled "Women call the retail shots... Is your store woman friendly?" appeared in the June 7/14, 2010 issue of Floor Covering Weekly. I share it with you here. Women call the retail shots. Is your store woman friendly? Women are becoming wealthier; 60 percent of women work, increasingly in managerial and professional positions. They own businesses, making them not only chief purchasing officers at home, but also at work. They represent the second largest group to purchase homes – ahead of single men. Powerful stuff; profitable stuff, too, if you understand the changes in the marketplace and accept that women call the retail shots. Look, then, at your store and retail experience from your customer’s perspective. Strip from your mind everything you know about flooring and carpet. Forget the lingo and the abbreviations. Rid your mind of the insider perspective. Instead, think in the same way that your consumer thinks. Refer to flooring in the same way she does. Consider flooring options – hard or soft – as a means to a very specific end for her. Is she looking for a textural look and feel [that has nothing to do with how we think of textures] or rather an elegant patterned look? What is it about the specific spaces she is seeking flooring for that really matter? Ask her questions to get to the root of what she has in mind for her home. Women seek knowledge and want a sense of control, particularly for projects involving their homes, with relatively high price points – like flooring – that they have to live with for seven to ten years. Do you remember the Home Depot “Do It Herself” workshops which empowered women with knowledge and engaged them in their projects? The end result: terrific pride, enthusiasm and a great deal of word-of-mouth buzz – not to mention purchases that otherwise wouldn’t have taken place. If you were to think of your retail experience as the equivalent of a project workshop, how differently might you think about it and prepare for it? I’m sure that the Home Depot workshops included a list of materials, instructions and additional reading – reference information, guidelines, recommendations - all materials that a participant would hold onto for future reference and certainly refer to as the project takes shape. Extend that same thought-process to your retail experience. What might you offer your women customers [or even your male customers; they appreciate thoughtfulness and practicality, too]? Perhaps a project folder to keep track of all of the elements relating to this flooring project, including a check-off list for each stage of the purchase decision, explaining what to expect? What about explaining how pad and carpet work together to form a flooring system and demonstrating how the pad investment affects the performance of the carpet and enhances the quality of the experience, too? What about detailing what a consumer should anticipate in terms of caring for the various flooring options available? What is the ideal short-term maintenance plan and what will need to be done longer-term? What if there are problems? Can you offer your customer a roadmap that outlines options, critical phone numbers, and what she can expect in terms of warranty support? Be honest in describing the options. Think about which best capture the needs of your consumer. Don’t think only in terms of what is best for you. Rather, think of the world from your customer’s perspective… She will appreciate it and remember you for it. Break each aspect of your customer’s purchase decision into its parts. If work takes place in the kitchen, for example, will your consumer need to have gas service turned off? Can you handle that for her? If not, what options does she have? Don’t abdicate responsibility for these kinds of decisions. They affect her overall shopping experience, and the better you anticipate, detail and describe so there are no surprises or negative aftereffects, the more satisfied she will be. The more you anticipate her needs, the more woman friendly you will be, and the more a woman will call the shots in your favor. If you enjoyed this article, consider subscribing to Flooring The Consumer via email or RSS. Thank you!